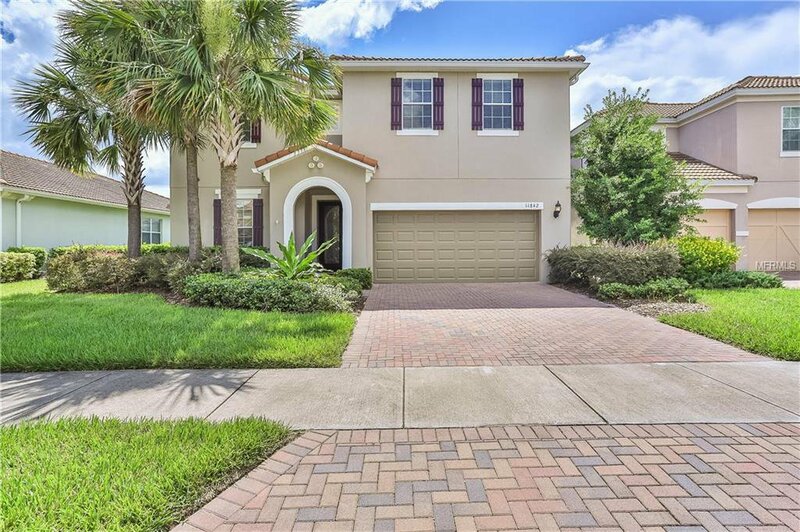 Wow, one of the best values in one of Central Florida's most amazing communities the 24/7 guard-gated resort style VILLAGE WALK IN LAKE NONA. This 5BR/3BA home shows like a model. Spacious and open first floor plan with 10’ foot ceilings and 9’ foot ceilings on the second floor. First floor has a nice drop zone, full guest suite with full bath and walk-in shower, perfect for out of town guests or in-laws to visit. Large master bedroom with huge walk-in closet and double racks and shelving. Gourmet kitchen includes stainless steel appliances, huge Kitchen Aide refrigerator, convection oven and microwave, built in wine rack and buffet with glass cabinet facing. All bottom cabinets have slide out bottom shelves. Second floor has 3 additional bedrooms; two with walk-in closets and full bath. A large play/game room perfect for the teens to have their own space. Custom fit 2” blinds on all windows. Large pavered lanai with fan and enclosed brand new sparkling pool. The HOA includes 24-hour guarded entrance gate, lawn & landscape maintenance, internet, cable and security system. And now we get to the amenities, so amazing you will never have to leave the community, 2 pools (resort style family and adult lap pool) State of the art fitness center, tennis courts, a basketball court, restaurant, gas station, hair salon and more. Located in the booming Lake Nona area, just off the 417, minutes to the airport and with great new schools, what else could you ask for. Schedule your appointment TODAY. Listing courtesy of REVOLUTION REALTY. Selling Office: CHARLES RUTENBERG REALTY ORLANDO.